The Okashira Jig Head is designed with meticulous, lifelike detail that not only draws in wary fish, but is first and foremost focused on perfecting action. 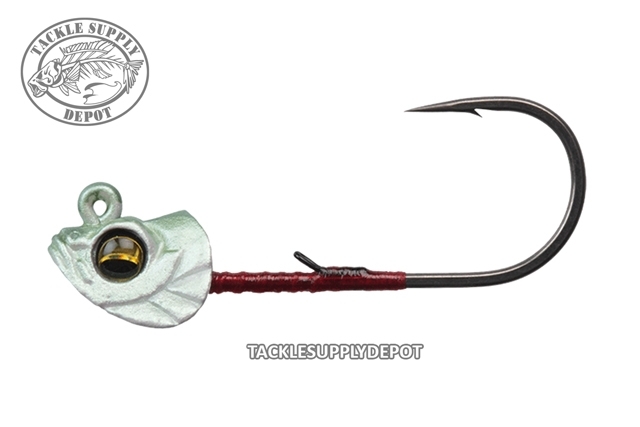 Featuring hand painted finishes, 3-D eyes and detailed gill plates, Super Slide hook and hand tied wire bait keeprs, the Okashira Jig Head is a perfect match to numerous soft body swimbaits and grubs on the market to fool gamefish of all sorts. Whether rigged on a single bait or used as part of an umbrella rig the Okashira Jig head is a creation of famed lure designer Yuki Ito that has gained much popularity from anglers across the world.